In 1905, the New York Times devoted nearly a full page to Wilhelm Funk and his artwork. Critic Charles de Kay wrote, “Mr. Funk is one of those Germans whose artistic life has been passed outside the Fatherland. For the last fifteen years he has been to all intents and purposes an American.” When McKay had tried to elicit quotes from Funk about German art, German artists, and members of the German community who had posed for him. Funk expressed appreciation for Expressionism, but otherwise distanced himself from other Germans. The following year, in February 1916, a reporter from American Art News reviewed Funk’s show at New York’s Reinhardt Galleries. He questioned the artist’s “tact and taste,” for displaying his Berlin portraits during war, but wrote that he was at the “zenith of his powers,” and admired his “strong fine brushwork and rich truthful color.” The reviewer particularly praised a portrait of three girls as “a modern Gainsborough in composition and handling.” That painting is lost, but a print of La Petite Angeline is one of the few extant examples that shows Funk’s facility in painting children. The World War ended on November 11, 1918. On June 19, 1919, “Wm. H. Funk ” applied for a passport to England, France, Holland, and Germany, if possible, to (1) retrieve his confiscated paintings, valued at $35,000 in order to return them to their owners and (2) “to get his mother which he left over there on account of difficulty of getting passage in 1914 after war began…As she was over eighty years of age, I decided to leave her there. I have had no communication from her since that time and do not know whether or not she is alive.” His application was rejected by the State Department with a statement that passports were not being issued to Germany. Funk’s friends wrote in his support, referring to him as “William.” A staff member of the Department of State suggested Funk should defer his trip “until conditions were more normal.” Funk persisted. A State Department official wrote to North Carolina for verification of his naturalization. The confirming papers, and payment of a dollar, secured his passport. Funk never returned to his chosen country. He remained in the country of his birth until his death in 1949. Was his decision for self-imposed exile due to a renewed love of his original homeland or was anti-German sentiment combined with bad luck the reason? Does he deserve to be forgotten or to be remembered? “Art News and Notes,” New York Times, January 16, 1910, page 14, col. 1-2. Peter C. Merrill, German Immigrant Artists in America (Scarecrow Press, 1997), 69-70; U.S. Customs Service, Passenger Lists of Vessels Arriving at New York, New York, 1820-1897, M237, Roll 551; List Number 995, Line: 41; J. W. Morrow, Clerk of the Superior Court, Mecklenburg County, State of North Carolina, Statement of Naturalization,” in Passport Applications, January 2, 1906–March 31, 1925. National Archives Records Administration, M1490, Roll 844, p. 483. “Portraits by Wilhelm Funk,” New York Times, January 5, 1902, page 24, col. 2. Charles de Kay, “German -Americans as Artists and Art Lovers,” New York Times, January 8, 1905, Part 4, page 1, col. 1-5. 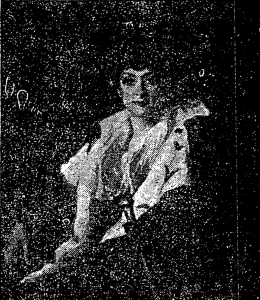 Nordica Memorial Association, “Lillian Nordica: America’s Greatest Diva,” http://www.lilliannordica.com/, accessed June, 2016; “Nordica, Lillian,” cantabile – subito, http://www.cantabile-subito.de/Sopranos/Nordica__Lillian/nordica__lillian.htm, accessed June 2016; “Kitty Cheatham,” Broadway Photographs, http://broadway.cas.sc.edu/content/kitty-cheatham, accessed June 2016; Ohio State University Libraries, “Elsie Janis and Her Gang,” Ohio State University Exhibitions, https://library.osu.edu/projects/elsie-janis/thegang.html, accessed April 2016; “European Portraits and a Musicale,“ New York Times, December 31, 1905, page 8, col. 6; “Costume Party in a Studio,” New York Times, April 4, 1906, page 9, col. 2; “Wilhelm Funk’s Musicale,” New York Times, January 30, 1907, page 9, col. 3. American Art News, October 18, 1911, page 1; Peter Hastings Falk, “Funk, Wilhelm,” Who Was Who in American Art (Sound View Press, 1985), 220; Sarah J. Moore, John White Alexander and the Construction of National Identity (Associated University Presses), 2003. American Art News, Vol. XIII, No. 13, January 2, 1915, page 4, col. 3; New York Times, April 29, 1915, page 9, col. 4-8. American Art News, Vol. 14, No. 20, February 19, 1916, page 2, col. 3. National Archives and Records Administration (NARA); Washington D.C.; NARA Series: Passport Applications, January 2, 1906 – March 31, 1925; Roll #: 844; Volume #: Roll 0844 – Certificates: 99500-99749, 24 Jul 1919-24 Jul 1919. American Art News, Vol. 18, No. 18, February 21, 1920, page 1, col. 1. American Art News, Vol. 18, No. 23, March 27, 1920, page 1, col. 1.